Finally something has happened worthy of a post! I was scanning Real Time Trains for any test train movements this week when I noticed an unusual journey pathed for this morning. 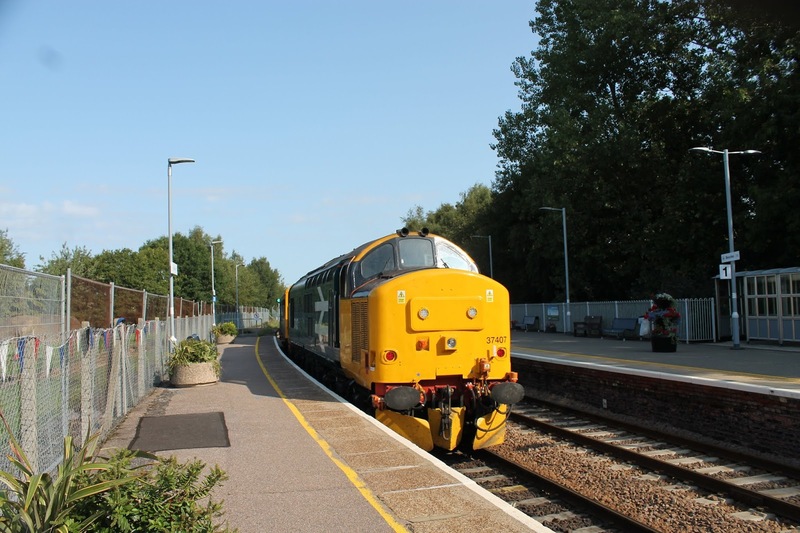 A journey from Ipswich to Peterborough. Not unusual, you might say as there's a train that does that every 2 hours. 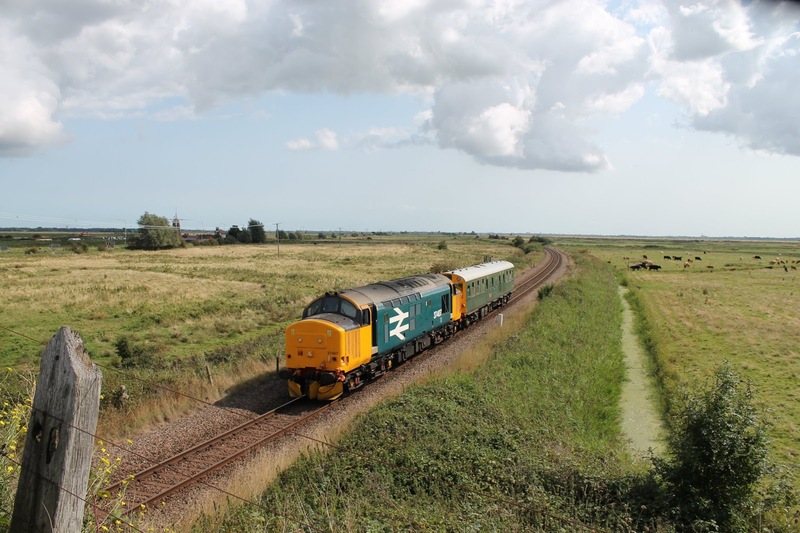 Not via he East Suffolk Line to Lowestoft, then reversing at Brundall to Yarmouth and back there isn't. So I traced the train back to Norwich, then back to Crewe where it originated from yesterday. Won't be a test train starting at Crewe, I deduced, plus it's operated by DRS not Colas. There was only one thing it could be - Network Rails Observation coach 975025 "Caroline", who no one can remember coming to these parts before. 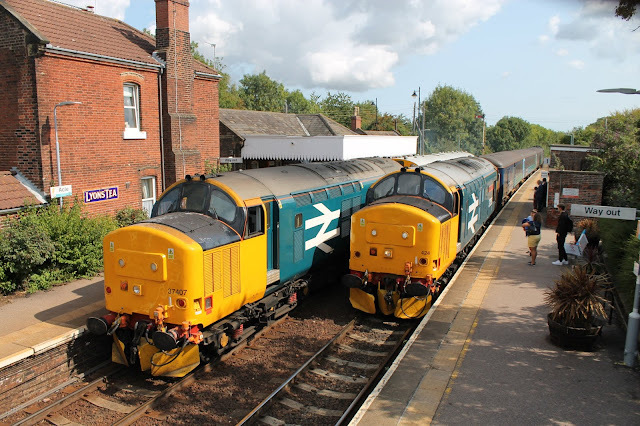 Now here's where I'm honest - I'm not totally sure what Caroline's role is, apart from to treat various industry people to a novel ride being pushed by a Class 37. But if she was coming I wanted to see her, however, due to a prior commitment this morning I couldn't chase her all over the place like I normally would have, so yesterday I drove to Harling Road to see her on her journey from Crewe, and this morning I was at Saxmundham. Tim covered for me at Beccles, and Acle, and my word he has got some belters! I've never seen Caroline before in the flesh - at least I don't think so. You'd think in 5 years working for Southeastern I'd have seen her but I truly don't recall it. So I got to my favourite haunt of Harling Road, knowing I'd have the station to myself, and got ready. 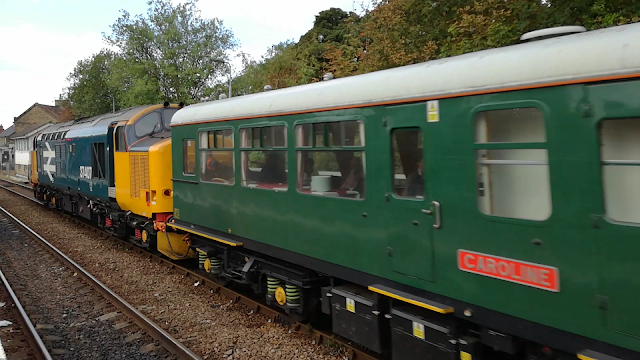 She was near enough on time, and soon came into view, pushed by the gleaming 37409. 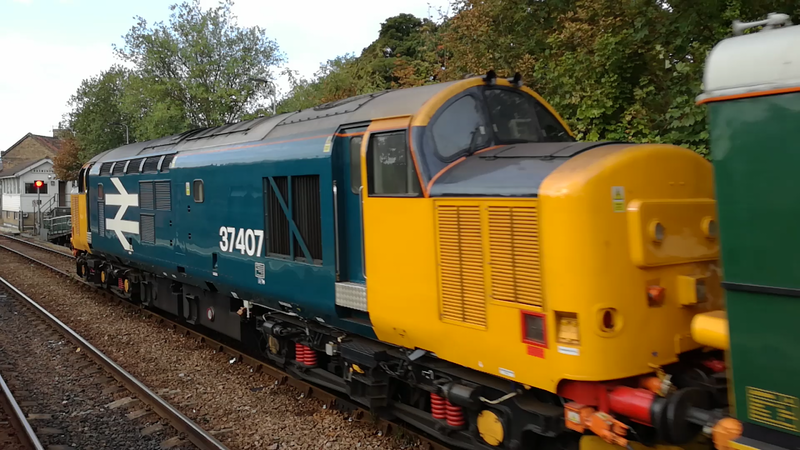 Overnight 37409 was relieved of its duties, and the equally gleaming 37407 replaced it, obviously needed at Crewe for an exam. That meant at Norwich last night 37407, 409 and the recently returned 37424(558) were in residence. 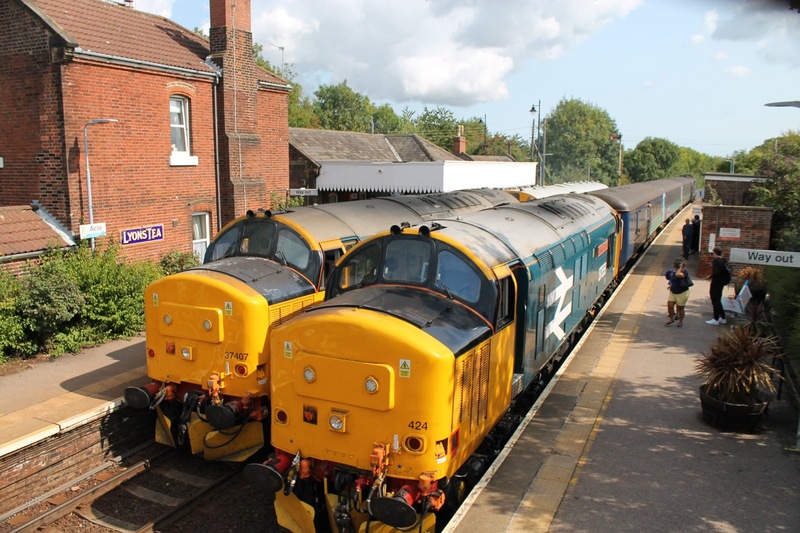 3 large logo 37's at Norwich. That may never happen again. 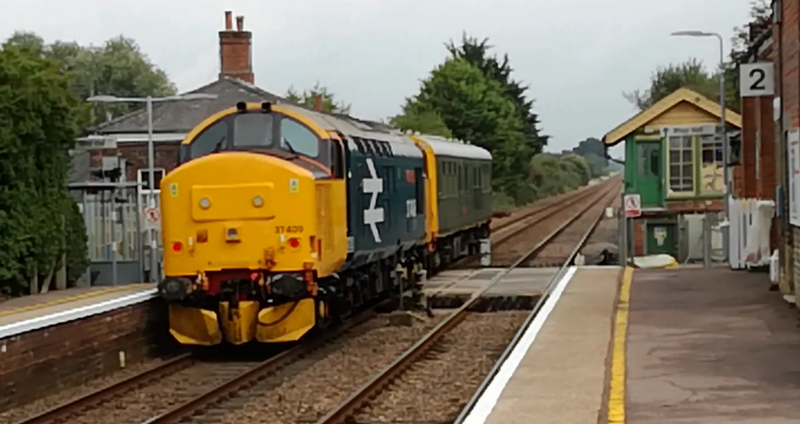 So at 0900 I was at Saxmundham, expecting Caroline to stop as booked, but no, she sailed gracefuly through, pushed by her new shiny friend. 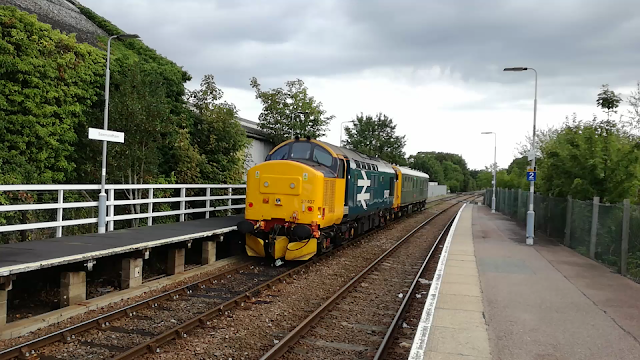 20 miles or so down the line and Tim was waiting for her at Beccles, although he was hampered by difficult light, and isn't very happy with these. Tim needn't have worried. I had worked out that Caroline would pass the Short Set at Acle, which, again, was an opportunity that may never happen again. 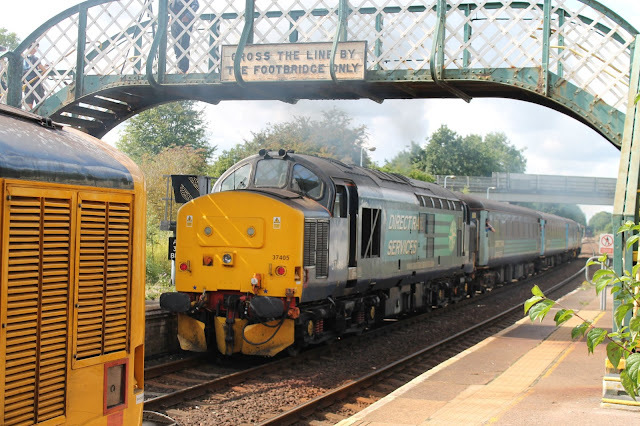 I'm happy to say that Tim has got some of the best pics I've ever seen, and that shot of the 2 large logos together of 37407 and 424 is an absolute masterpiece. Thanks, Tim - gutted I missed it myself but wow! That was a nice surprise, and a good way to break my drought of posts. However, you won't have long to wait for the next one. I'm in the big smoke tomorrow, finding out just how far you can travel for £1.50! Here it's a couple of stops but in London.....watch this space! Hello folks. Just thought I ought to post something to indicate that I'm still here. Unfotunately, for various reasons I'm not getting out much at the moment. Apart from the recent heat, which not even my insanity would let me ride around on buses passing as saunas, my new wheels has developed a baffling fault which is restricting my movements and consuming much resources. 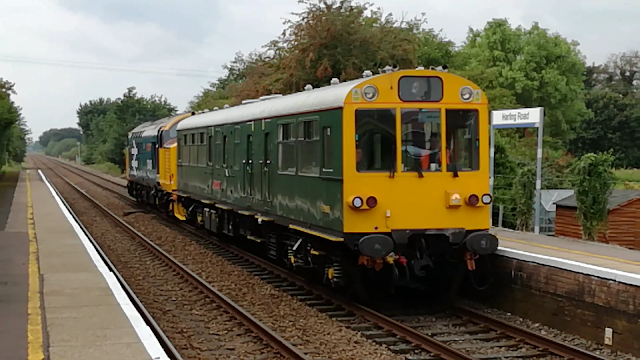 Also little of note has happened, certainly in our locality, except I saw today the fortnightly service between Eye and Ipswich, operated by Fareline Travel, the 121, is being axed from 4th September. I wonder how much is being saved compared to how many people will be inconvenienced. It's always been pretty well patronised when I've seen it. 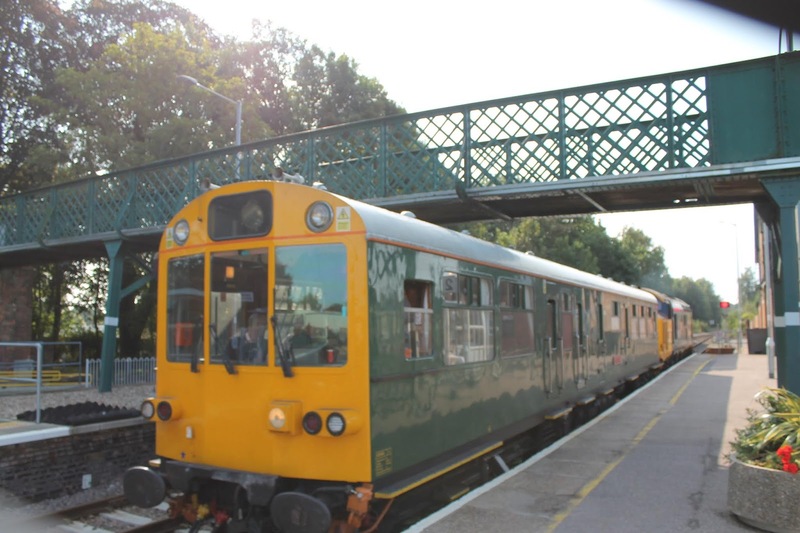 Galloway are splitting the 113/114 Ipswich - Diss service at Eye from September, with a new service 112 operating the Eye - Diss section. It looks like one of those same bus connections so must be the 35km rule coming into play. Thanks to those who have got in touch, and hopefully things will pick up again soon. 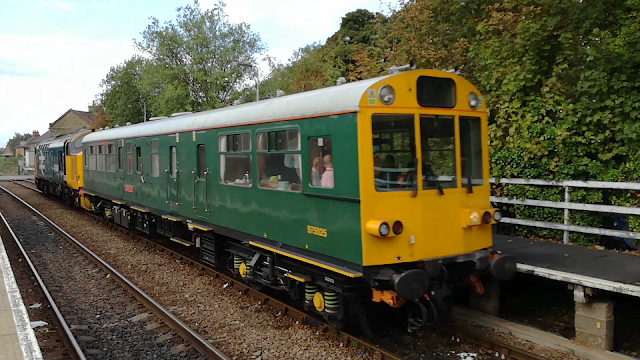 In the meantime don't forget sites like Railcam, Dawlish Beach, and the utterly brilliant Big Jet TV (if you like big jets) are available for some decent armchair viewing.